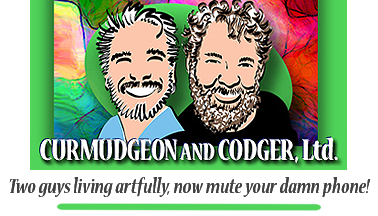 Our Tale – Curmudgeon and Codger, Ltd.
Khrysso and Grey were both artists in the Arts District of Canton, Ohio, and knew of each other for several years but had never directly met. Grey had a studio and produced theatre in the Kathleen Howland Theatre at Second April Galerie. Khrysso was a consignment artist at Second April. In August of 2016 the gallery underwent a change of ownership and renovations, and Khrysso decided to jump in and lend a more active hand. On the morning of the grand re-opening, with artists rushing to get the space in order, a circuit blew and Khrysso figured Grey was a veteran in the building who might be able to help. (He was.) Thus, their first meeting. A four-hour coffee date several days later ended only when the cafe threw them out at closing. The connection they felt was instantaneous, and the course of their relationship was, as Grey put it, inevitable. In the ensuing months Grey was invited to become a fellow artist-in-residence at The Studios at l’Auberge, and in July 2017 the guys married. Grey has under his belt a former career as a managing stylist and educator in the Cosmetology industry. He changed careers in 1990 when he got a degree from the Art Institute of Pittsburgh and became an award-winning graphic designer, writer, and editor. He left the corporate world in 2015 to open his own studio and after decades in digital art, to get his hands dirty again with oil and acrylic paints. He also has over 25 years experience in theatre as an actor, director, and producer. 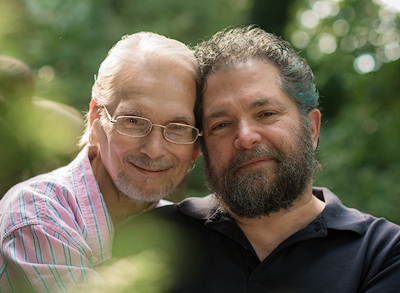 Khrysso has been by turns a wordsmith, a gay-rights activist, a folk musician, and a visual artist, with academic interests in Linguistics and Rhetoric (both of which he studied at Ohio State) and Religion and Liturgical Studies. (He took a Master of Theological Studies degree from the Iliff School of Theology in Denver in 2002.) He has written for news and feature periodicals, technical publishers, and marketing services departments, and he still does a bit of editing from time to time. He has played the mountain dulcimer since 1988, and his folk-music interests include–in addition to recording traditional and original songs–publishing print collections of traditional music for music lovers in general and dulcimerists in particular. He has long been interested in paper, which he began collecting in the early ’90s, and he finally started collaging around 2008. Together, the Artists LeFey continued for a time with dear friends to operate a bricks-and-mortar presence in the gallery in the Arts District where they met. They now operate an online gallery of high quality print-on-demand art, also representing several other artists, with hundreds of choices available for every taste and decor. Grey is a playwright and a member of the Dramatists Guild, and he continues to produce theatre with his company, Gilda Presents! Khrysso and Grey relocated in September 2018 to the Morongo Basin in southern California, near Palm Springs. Khrysso loves dry climates, Grey thrives in the heat, so the two are happy in the desert.